Home → Blog → Fireplace Facts: What are Firedogs? Firedogs or andirons? 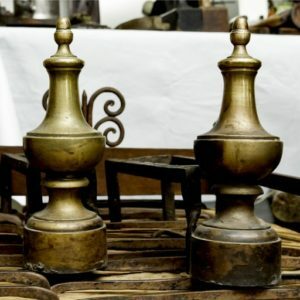 We at The Antique Fireplace Restoration Company look at why they are an important addition. More than just a flourish: firedogs help to keep the fireplace burning for as long as possible. Image by Carlos Velayos (via Shutterstock). When you buy an antique fireplace, you see two posts on the left and right hand sides of your fireplace. They have one essential function as well as being an embellishment to your hearth. They are known as andirons, or firedogs and embellish horizontal iron bars. Their use predates the Edwardian and Victorian times. Firedogs have been used since the Ancient Greek times. Along open fires, they were used to support spits for cooking meat. By the time when cast iron fireplaces rose in popularity, their modern day role changed. Instead of supporting hog roasts, they are used to keep the fire burning and well ventilated. In their comparatively contemporary role, the horizontal bar is a bridge for logs and solid. The firedogs place the horizontal section above ground. This enables for some ventilation, to stop the fire from going out too quickly. Both terms refer to exactly the same item. Firedogs (or fire dogs to give its alternative spelling) is an American English term. It is also finding favour on our side of the Atlantic Ocean. In some countries, they were also referred to as Moon Idols or Moon Horns. How much should I expect to pay for firedogs (or andirons)? Prices depend on the complexity and the age of their design. You can pick up some from £20 to £200 at a DIY chain store. Expect to pay £300 to £1,000 for original cast iron andirons (based on design, exclusivity, and condition). The Antique Fireplace Restoration Company, 10 May 2017.